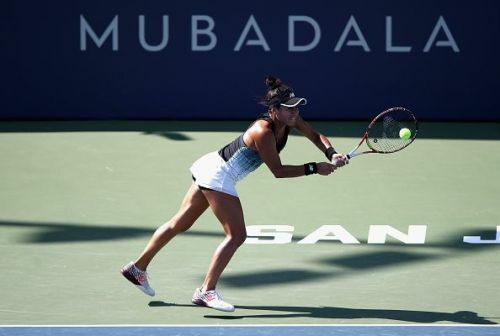 Heather Watson had a few problems on the court but got the result she wanted, to start her Mubadala Silicon Valley Classic campaign on Tuesday afternoon. The unseeded Brit had a challenge on her hands against Claire Liu but reeled in a three-set win on Stadium Court to win 6-4, 3-6, 6-4. This was a first-time meeting between the two and a return for the Brit to this tournament in six years. This is also the first time that Watson is in action since July. 3. The hiatus gave the 26-year-old time to get her game into play with the part of the hard court season in action. In the match, both stayed on serve with solid first serves, but clearly suffered on return. With the advantage of leading after her serve, Liu attacked Watson in the sixth, double-faulting during the second point. It led the American to force deuce with the 26-year-old and go for the break using sliced shots near the line to beat her down. It didn’t work for long as a drive with the AD point in Watson’s favour was called out and remained that way after a challenge. It got her in the seventh, losing a 30-0 lead due to unforced errors that handed Watson the first break of the set. Liu broke back with Watson struggling with the second serves, but she still focussed enough to rattle the young American. She earned a double break with the chance to serve for the set. She made it count in the tenth, earning two set points that gave her the match lead in 46 minutes. Watson nailed 70 percent of points from the first serve that did enough to get her where she wanted to be. Liu had some elements that were good, but clearly needed to build on them. Liu was having an incredible turnaround in the second set shutting down Watson on returns. She missed three from it that led to the 18-year-old starting off to a 2-0 run. She made it three straight with another good hold of serve. Watson made it her best interest to call out the coach who gave her tips to overcome the deficit. A hold in the fourth denied her opponent a double break in hand showing a heavier fight against the American’s serve. She got the second game under her belt giving the look of her taking back control. Watson found herself in a tight spot in the sixth with Liu forcing deuce. It became drawn out, spanning more than six breaks, before the 18-year-old found a way to score the key shot that gave her back a two-game buffer. Watson didn’t let that bother her as she responded with a break in the seventh, cutting Liu’s lead in half. The goal of levelling the score went south as she committed unforced errors that allowed the American her chance to serve for a third set. She did just that, making good on her improving qualities to force a decider after 46 minutes. While her second serve wasn’t at a place she wished it to be, the 18-year-old had her first serve in play and built her confidence. Watson put that to a stop as she came out on a mission to disallow Liu any further momentum. She went after Liu’s second serve right from the start, earning a 3-0 lead. The 26-year-old went for the double break, earning free points on her opponent's forehand errors. She battled back to force deuce before earning the win in the fourth. It was the start to yet another comeback in the match with Liu making up all the lost ground to even up after six. Watson made enough mistakes to let the American back into the decider with little left to be played. The battle was on as control became a key to finishing the match on their own terms in the seventh. Making the first show of effort was the Brit who dug in on deuce to make her service game count. Despite playing a few breaks, she got it locked down before taking a coaching call. The American had to hold serve against the 26-year-old who served for the match in the tenth. She did get it done as Watson made the push to finish her off and secure a spot in the second round after 2 hours and 24 minutes. With a well-deserved win, she will take time to recover and analyze her game before she faces Venus Williams in Thursday's second rounder.